BIM in Russia: Off we go! Cosmic scale event in the construction industry. 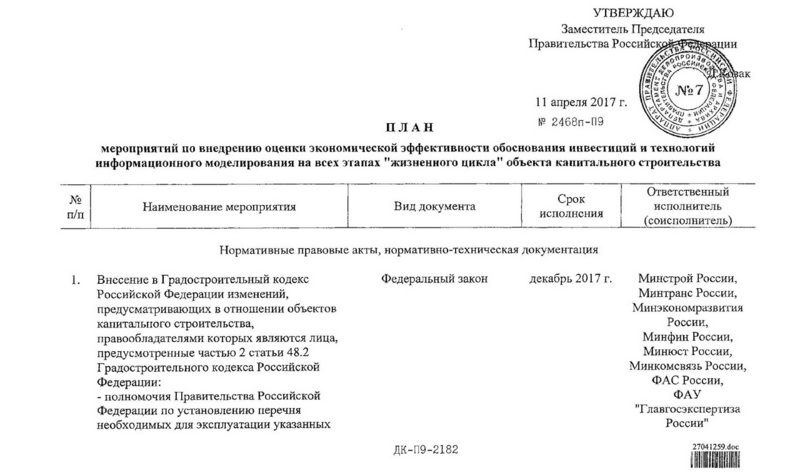 An event, still not understood completely by most citizens of the country, and yet so long-awaited and significant for the construction industry took place on the wonderful Russian holiday, Space Exploration Day: an action plan (Roadmap) for implementing information modeling technologies (BIM) has been approved. To put you in the picture, we give the full official title of the document: “Action Plan to adopt the cost-effectiveness analysis of feasibility study and information modeling technologies at all stages of the life cycle of the capital construction project”. That means the Government has amended its previous attitude to the BIM, which had been limited to the design. Moreover, the BIM is going to act as the crucial feasibility study tool and will be assisted by the information systems of the state both already existing and being in the process of development: FGIS TP (Federal Government information system of land use planning), ISOGD (Urban development information system), FGIS “Pricing in construction”, EGRZ (Unified state register of lands), and others. Apart from technical setting and standardization in design, construction, and operation of facilities using BIM technologies, the Roadmap provides for a lot of work aimed at harmonization of technical and budgetary standards with the construction resources classifier. In addition, the functions of the FGIS “Pricing in Construction” have been extended up to the stage of operation and even demolition. In conclusion, we shall mention that the proposals of the professional community BIM Association have collected, which are focused on the implementation of BIM technologies in the paradigm of ensuring continuous monitoring of the compliance of current project parameters with the approved feasibility study indicators have occupied their rightful place in the approved Roadmap! BIM Association is going to offer our readers a series of publications devoted to a new vision of the role the information modeling technologies play in Russia soon.